I’m in an MFA program now, it’s two years long and I’m in the second of four semesters. I’m in New York, studying at Parsons. "Sagarika Sundaram has a lot going on. The young designer’s first two rug collections, for Floor_Story and Tiipoi, debuted London Design Festival last year, she is busy mastering every technique from weaving to felting, carding to dyeing, and is about to join textile artist Claudy Jongstra in Friesland in the Netherlands. All in addition to her day job in brand/UX strategy. ‘Life is long, I have time,’ she says with a smile. Her designs for Floor_Story and Tiipoi are quite different beasts. The two rugs for the former are tonal creations in handtufted wool, Laxmi in pinkish pastels and Rekha in deep shades of red. Jama-Khan blue and pink for Tiipoi, handwoven cotton flatweaves, have something of Mondrian about them. ‘I wanted to see what I could do with geometrics,’ says Sundaram. She is currently working on her next collection for Floor_Story, which will be based on the Madras check, the traditional pattern from her native city in India. More than a rehash, the designs play with the idea of translucent folds, injecting a sense of three-dimensionality. With these new rugs Sundaram intends to delve even deeper into the production of her works, spurred on by a keen interest in technique. That same interest will see her join Jongstra this spring to learn more about the making of textiles, from sheep to finished piece. ML"
Not sure how I feel about these hair balls from Holland...as beautiful as they are. "Calves, fed only on milk and kept closely confines so that when they are killed after a year of such treatment they yield the pale tender veal we apparently crave, start to eat their own hair. The muscular movement of their stomachs, combined with the heat and moisture, felts the hair into solid balls, which in extreme cases weight 750 gm and measure 15 cm across. such an object, the sight of which is a compelling reason for turning vegetarian, is rare. Usually the hair balls are much smaller and, forgetting their origin for a while, one can enjoy their range of colours and textures." This is from a book Jason Collingwood gave me as a present after my rug weaving course with him. His father wrote this book and it was one of his favourites out of everything he put out. The spring wind, right through the rib"
I find that I love doing clothes and costumes for performers, outfits take on a new life and energy on stage. I'm doing some brand identity and styling work for a band called Eclipse - they're a steel pan orchestra. Apart from bringing the v-i-b-e to the party, I love that they make a positive exchange with society. Eclipse has a core group that plays concerts and gigs, but they also perform as a community band that school children can join as an after-school activity. I took inspiration from their name for their look - think the sun, stars, flares etc. Big, bold, fat shapes - circles, rectangles for maximum visual impact.I wanted each member to have a different outfit that reflected their personality somewhat. I had to think of a way of pulling their looks together without being too matchy-matchy. We had a short time-frame so I had to experiment quickly to find a technique that would work. I used gold leaf to embellish t-shirts and a skirt. Not sure if my gilding efforts are dry-cleanable, but we had a short deadline and I fell back old tricks, viz., when in doubt, use tape - good ol' double-sided in this case. Stickers. I love stickers. They're the perfect way to add shiny to an outfit - I wear them on my clothes all the time - it's fun and playful. Plus, brush them off after they lose their glue and your clothes are back to normal. It was great fun putting this together. I look forward to v2 - our next milestone is a gig in January. Trying to think of a way to get some gold fringe on someones arms - would be fun to watch it toss around as they play! Next time I'll get a better photograph of the band playing. What is felt? I've discovered that while most people know felt when they see it, they don't know it by name. Felt is both a noun and verb - you can make felt, and you can also felt. Felting is the process of evenly rubbing wet wool (by hand or machine) until little hooks present on every strand enmesh together into a soft fabric. You find felt across the world wherever you find sheep - Ireland, Wales, Canada, Tibet, New Zealand, Holland, Jammu & Kashmir, Iran. People have made felt shoes, rugs, blankets, jackets and so on for thousands of years. The Mongolians even made their homes, yurts, from heavy-duty felt. Today it is also used for laptop sleeves, acoustics and upholstery. Felt is one of the oldest materials known to mankind and this is partly why I am fascinated by it. Last week I spent a week in Piemonte at a felt workshop with the magnificent Claudy Jongstra. Claudy's felt is large, expressive, super-contemporary. She's made robes for Star Wars, pieces for Marina Abramovic and Stella McCartney. But consider that the fun stuff. Her core body of work consists of large installations, wall coverings and tapestries in institutions, airports, museums and the like. Claudy says she likes to bring softness to places that most need it. I first came across Claudy's work online whilst looking for references for some felt rugs I was sampling. If Claudy's work is magnificent in pictures, I find it breathtaking in person. The first piece I physically saw was a wall-covering in the Amsterdam Botanical Garden café. Striking from a distance, richly detailed up close, I spent some time looking it. Claudy is working on a piece for SF MoMa right now so I hope more of you will encounter her work soon. Claudy lives in Friesland in northern Holland. She keeps her own flock of sheep as a supply of wool for her artwork. She grows her own plants to dye her wool. She also regularly runs art workshops for children with the intention of bringing them closer to nature. As I have learnt more about her, I have grown to admire the way she has set up her life and her practice - integrated with nature and society. When I heard that she was doing this workshop I knew that I had no choice but to sign up. I arrived in Italy with little to no idea about what the workshop was going to be like. Turned out that Claudy had brought along a little crew of instructors to enrich our felt-work. We had Annette giving us the lowdown on natural dyeing, Tijo teaching us about painting with minerals, Amelie and Rebecca for all-round help and Gia guiding us through an hour of body-movement in the mornings. The workshop was titled, 'From Intuition to Impulse - Constant Meander of Perception, Selfpath, Transformation, Impulse'. It's oddly phrased – probably a literal translation from the Dutch – but I like that. Says a familiar message in an unfamiliar, energetic way. The title in fact captures the spirit of the workshop perfectly. The instruction emphasised less on technique and more on sensing the material. I felt vulnerable - unsure if I would get it 'right'. But I quickly discarded this feeling and rose into a flow of experimentation. We worked with different materials based on the theme of the day. Around Day 2 I began feeling the medium for myself, and set off on a line of exploration – 'painting' with wool and silk, churning out one colour study after another. A bowl growing beneath the ground, what does it feel like? Growing layer upon layer around a core, to be revealed again when brought up from of the earth; left naked. Rhythmical work to feel and understand the patternity in seeds. Sensing your roots, your solid ground underneath your being that allows for growth. All previous elements & experiments come together to let reverberation sink in and let offer deeper insights and connection. A selection of my 'colour-studies' - somehow VERY hard to take good photos of them. Background: dark green + dark blue wool. As I found myself layering quite thin, I began using the white wool as a backing layer to 'glue' the piece and hold it all together. The same piece, dry - in different light. You can see how the silk shines against the wool. The Wensleydale sheep is known for its curly locks. I'm particularly fond of this piece - it looks like a stormy cloud to me. Again, I was felting very thin at this point, interested in exploring delicacy. Going larger, felting tighter. This was the last piece I made during the workshop. An overview of the pieces for a sense of size. One afternoon we were asked to weave using a piece of cardboard as a base. It was my first time doing a lo-fi weave. I loved it. Weaving is easy! (I need that on a t-shirt). The point of weaving was to potentially integrate it in a felt piece. Busy with my colour-studies, I never got around to it. On the 'seed day' we started the day with a blind drawing exercise - drawing a seed without looking down at the paper. I love these kinds of exercises, the ones that force you to LOOK. Though the work sessions were largely self-driven, every aspect of the workshop was thought through, from our morning warmup exercises to the unbelievable vegetarian food (both of which deserve their own write-ups). Our morning ritual - an hour of eurhythmics. Here, we had just finished spending a few minutes looking at some plants. We are now in the midst of capturing their character through moving our body. Standard stuff. Creamy cheese in a half a walnut shell, grapes covered in cheese then rolled in nuts and a ball of crumbed risotto disguised as a pear. On the last evening of the workshop, we all got together and shared a couple of words about our work and the whole experience. Let's say it got emotional. We worked on the lawns of a house that was once the residence of the Marquis of the town – Incisiana. It's now a bed & breakfast that also makes very good wine. More info about the wine here. The view from our work stations was grapevines, hills, forest and terracotta roofs from the village beyond. The weather was crisp and sunny for the most part and the rain was considerate enough to arrive at 6pm on our last day. What I loved about this workshop was its conceptual rigour. It's hard to find learning opportunities with people whose judgement you trust. This was one of them, and I am grateful for the experience. In these five days I answered many questions about my relationship with felt, and I've now set some kind of direction going forward. It's London Design Festival this week and I have two collections launching tomorrow at Designjunction – a cool trade fair in Holborn. Sagarika Sundaram for FLOOR_STORY is a pair of hand-tufted wool rugs. My second collection is a set of handwoven cotton rugs and cushions for homeware brand Tiipoi. Jama-khan rectangular cushion - 30 x 50 cms. Both projects have been a labour of love and I'm delighted that they're out, all set for new lives in homes around the world. Get in touch if you need information about prices etc. Another example of a drape – the south Indian Tamilian madisar. It's a clever garment that makes a pair of trousers along with a cover across the upper body, all out of once piece of cloth 9 yards long. The madisar can be quite unflattering, but I love how elegant MS Subbalakshmi looks wearing one in this photograph. Standing barefoot on a mud floor beside a tulsi (holy basil) plant outside a house, you wouldn't guess that she was one the most famous south Indian classical singers in India, a legend in her time. The gold odiyanam around her waist, and maybe the fullness of her smile, are the only signs that point to her prosperity. It would have been her 100th birthday on 16th September - more about her in this 20 minute documentary by her granddaughter. I tried to learn this way of tying a sari from my grandmother, she used to wear one everyday. But by the time I got around to asking she was losing her memory. My mother knows how to wear one but it takes her a bit of memory jogging. I was delighted when she sent me a how-to video on Facebook the other day...haven't tried it yet though. I would have to tie a couple of sarongs together to create a base cloth long enough as I don't have a 9-yard sari with me in London. A couple of weeks ago I spent a week learning how to weave a rug from Jason Collingwood. He lives and works in Nayland, Suffolk, out of a building that was once the village school. The workshop belonged to his father, the great Peter Collingwood – weaver, rug-maker, loom inventor, teacher, author, OBE decliner, renaissance man. b) I wanted to sensitise myself towards what makes a good woven rug. The design was based on a simple grid that I tried to bring some interest to using proportion and colour. As a black and white design it looks like a chequerboard, but using colour I made some bits disappear, and brought a 'verticality' to the composition. The design was based on a quick sketch I made on the train up to his place and refined through the week. Every evening I would go back to my room and adjust the composition a little bit, show up in the morning and say, "erm, Jason, it's changed again!". Jason is a patient man. It was a great five days, intense work - I was weaving for 8-12 hours a day to make sure I finished on time. Once I got into the flow it was great chatting with Jason. In the evenings I had BBC Radio 6 for company. Before I left, I was touched when Jason gave me a book by his father, Peter's favourite out of everything he had written. Weaving on a big rug loom is a bit like playing a musical instrument with all four limbs. Some videos coming soon. I was walking in San Francisco's Mission district on Friday night and spotted a big glowing sign that said 'Felt Rugs'. A whole shop devoted to felt rugs in a prime location! I went back to visit yesterday and met the people who run it. Dodd and Melina Raissnia are a husband and wife team who have been running their business for 15 years. They make high-quality felt rugs and sell them all over the world. They even have people buying their hefty wool pieces in hot countries like Thailand. I guess air-conditioning means that furnishing a room to match your local climate isn't such a big deal anymore. Dodd is originally from Iran, where he and Melina made their first pieces. They showed me some beautiful old rugs that they collected along the way - I have never seen such fine felt craftsmanship in person before. It's surprising that not many Iranians I speak to know about Iran's great felt heritage. Dodd said that its almost impossible to find felt pieces today and that his is probably the finest (and possibly only) collection in the world from the 30s and 40s. He said that even the craftspeople whom he bought these rugs from have forgotten how to make them. Imagine that. Is it not a sign that civilisation is moving backward when we lose our library of tools and techniques? Or is it just that this beautiful craft has become obsolete because it is no longer considered valuable to society. Reminds me of a quote I read from David Abraham of Abraham & Thakore - something along the lines of 'tradition is only relevant when it is useful'. But surely beauty is a utility too. I love adding folding techniques from around the world to my ever-expanding quiver. Here are instructions on how to wear a Bhutanese kira, from a book called 'Thunder Dragon Textiles from Bhutan' by Mark Bartholemew. If you look at the instructions carefully you'll see that it leaves the sides of your body exposed, which is why it's worn on top of a tunic-like garment. Mentally saved to try with a scarf and a leather skirt/crop top foundation, maybe for a party. There is endless inspiration in Jason's back room where I am staying. It contains his father's well organised collection of books on textiles and craft. I pick out books that catch my attention when I'm done weaving for the day. Being here reminds me of spending time in my school library, or in the room full of books my parents once had at home in Dubai. I find it relaxing to read like this again. Authors in these books consistently mourn the loss of material techniques to modern life. For example, Saudi nomads, as you would think nomads would, place little to no value on material possessions and repurpose objects into new more useful ones as soon as the originals have lost their purpose. Indonesia succumbed to Dutch colonialists who wanted to control their craft (and thereby their economy). Etc etc. I feel sad to read about these disappearances, these losses of human ingenuity. I doubt we will ever again make great analogue breakthroughs in this world of distraction (i.e. wifi) that we live in. Craft needs time, patience, love and – I truly believe this – boredom to bloom. But then perhaps this is the natural tide of human evolution - things fall apart, get lost, evolve, amalgamate. 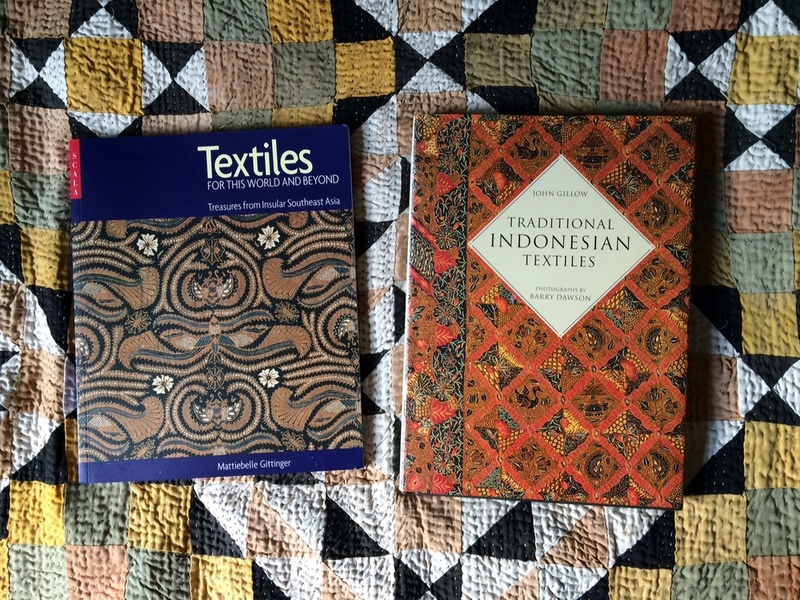 in resist techniques, particularly Indonesian batik. I'm off to Nayland tomorrow, to learn how to weave a rug with Jason Collingwood. I was told by one of my weaving teachers at Handweavers that his father wrote the bible of rug weaving. She showed me the book. It was a tome. I will be staying in his back room for five days, weaving during the day, reading and drawing in the evening. Looking forward to it very much. I'll send occasional updates about work and experiments.